You are here: Home / Ethnic Groups / The People of Kalimantan / Who are the Bakumpai? The Bakumpai are a group of Dayak people who speak the Bakumpai language and call themselves the Bakumpai. However, there are many similarities between the Bakumpai and the Dayak ethnic groups around them. In spite of this, they choose to identify themselves as different from the Dayak groups mainly because of their Islamic religion (the Dayak majority are Christian). Most Bakumpai live near the Barito River, which flows through the province of Central Kalimantan. In Southern Kalimantan, the Bakumpai live in Barito Kuala regency while those in Central Kalimantan live in South Barito regency. Their neighbors in the south are the Banjar people and in the north the Ngaju and Maanyan peoples. 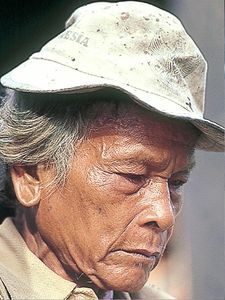 Some experts speculate that the Bakumpai are one of the sub-groups of the Ngaju people group, although the Bakumpai consider themselves a separate people group. The Bakumpai language is part of the Dayak language group which includes the Kohin, Ot Danum, Ngaju and Siang. The area where the Bakumpai live has many rivers. Due to this, the Bakumpai have developed technology for water transportation. They usually farm wet fields which depend on the rise and fall of the river. Their other work includes cultivation of unirrigated fields, fishing in the rivers, trade, and production of household tools. The Bakumpai social life and culture are influenced mainly by the culture of the Banjar people. In the past, when the area of Banjarmasin was still a Hindu kingdom, the Bakumpai social system followed the Hindu caste system. The system of kinship that the Bakumpai follows is the Banjar bilateral system. The husband and wife together carry out their important roles within the family. According to the traditions of the Bakumpai, a newly married couple is free to choose their place to live. They may choose to live with the husband’s relatives, with the wife’s relatives, or separately in their own home. The system of dividing inheritance follows the rules of Islam. Generally, the Bakumpai are followers of Islam. The influence of Islam can be seen in almost every aspect of their lives: in their social system, their extended family relationships, and even in their artistic endeavors. Marabahan, the center of the area where the Bakumpai live, has already produced many famous Islamic teachers who have spread Islamic teaching as far as the source of the Barito River. The number of Bakumpai people is steadily increasing, not only because of offspring, but also through the entrance of Dayak Christians who join the Bakumpai by converting to Islam. In fact, if a Dayak changes from a Christian or Kaharingan (traditional religion) to Islam, he or she will consider himself Bakumpai and use the Bakumpai language even when speaking to his own Dayak people group or his family. At this time the Bakumpai need technological improvement in agricultural methods to develop their swampy land. At present, their irrigation system for the rice fields is totally dependent on the rise and fall of the tides, either from the sea or from the branches of the Barito River. They do not yet have a dependable irrigation system sufficient for all their needs. The Bakumpai need more medical attention, clinics, and medical personnel.